Why an article about seeds?!!! Because they are excellent for our health! Some people don’t see any point in it, but they are real nutrient bombs! They have everything right, real natural food supplements! Depending on the seeds, the contributions may vary, but the benefits for your body are undeniable. What kind of seeds can we eat? 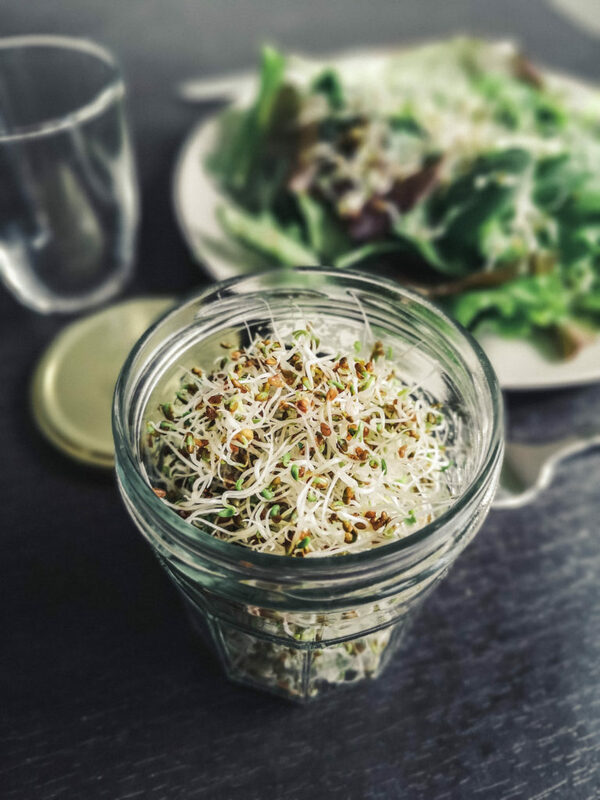 Vegetable and herbal seeds: alfalfa, carrot, fennel, radish, basil, parsley… Be careful, do not let tomato or eggplant seeds sprout for consumption, they are toxic! Personally, I mainly use alfafafa seeds, which are very small and have a very good taste in the mouth, I find them in organic shops. How to make them germinate? I recently tested a system that seemed practical to me and it was conclusive! A pot that makes it easy to soak, rinse and drain seeds. In 3-5 days, your sprouted seeds are ready! First, it is necessary to soak the seeds for 12 hours in water. I often do this step in the evening and the next morning, we are ready to move on to the next step. In the morning you have to empty the water (spill the pot, the lid has holes). Fill the pot again with fresh water to rinse the seeds, close the lid and empty the water. In the evening, the seeds are rinsed again with fresh water. Rinsing is very important, to be done twice a day, for 3 to 5 days depending on the seeds used. For those who are interested in this Germline brand germoir, you can find it in organic stores or here ! Once ready, it will be stored in a sealed jar in the refrigerator for 5 days. In a salad, as a garnish on your gazpacho, on a sesame puree toast or peanut butter, a sandwich, fish or even vegetables, anything is possible! I have already adopted them! And you? what do you think of the germinated seeds?